SEMENYIH (Nov 4): Every family deserves a decent shelter over their heads but there are some of them who just can’t afford one, hence, the market needs an inclusive scheme that could bring all the stakeholders together to help those in need to find their ideal home while resolving the problem of market supply mismatch, said The Edge Media Group chairman Datuk Tong Kooi Ong. “The issue of being able to own your home has become one that has risen to the top of agendas all over the world. 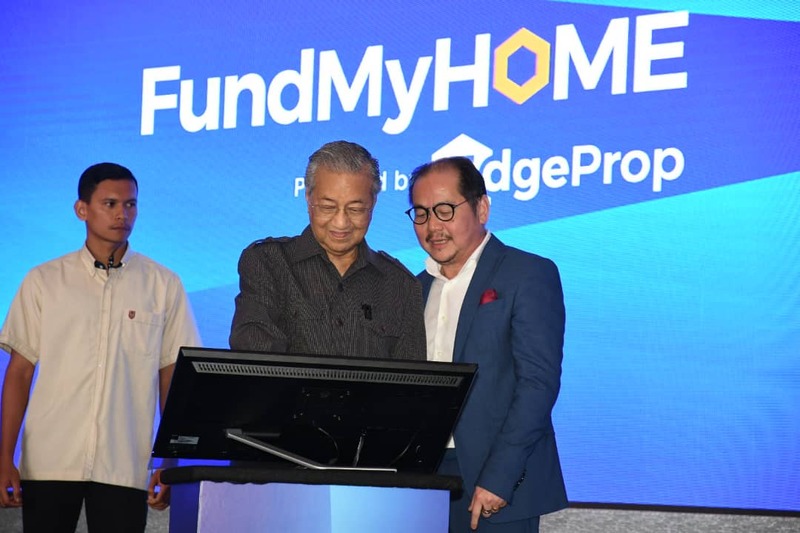 And rightly so, because I believe having a home is not just an economic right but a human right carrying a sense of self-esteem,” Tong said in his speech at the launch of FundMyHome.com which was officiated by Prime Minister Tun Dr Mahathir Mohamad today. The balance 80% of the cost of the property is contributed by participating institutions, who share the returns from changes in the future value of the home. “It is obvious to me that the answer lies in deleveraging the household. I am also very excited to harness recent developments in digital technologies, tap business models in the sharing and subscription economies, and use peer to peer and crowdfunding platforms. Our solution rests on bringing all of these together,” added Tong. He described FundMyHome as an inclusive scheme as it leaves out no one who is now part of the ecosystem. Besides helping homebuyers, it helps developers to sell their properties, both currently unsold and future launches. It also includes estate agents as facilitators for their house buyers and financial advisors guiding clients who are interested to become property investors. The platform works with banks and institutions to provide financing as investors or in creating structured products for their customers. Tong stressed that escalating house prices is not caused by a lack of supply, but the real crux of the problem is the fact that consumers the world over, including in Malaysia, have too much financial commitments which impact their ability to borrow to purchase a house. The launch of FundMyHome.com was held at EcoWorld Gallery in Eco Majestic today. Also present was Finance Minister Lim Guan Eng, Deputy Housing and Local Government Minister Datuk Raja Kamarul Bahrin Shah Raja Ahmad and Selangor Menteri Besar Amirudin Shari. Once the Securities Commission approves the property exchange, the man-on-the-street will have a new asset class to invest in, with yield, low risk and potential capital gains over the long-term, Tong added. “FundMyHome.com democratises home ownership and stimulates the housing industry without any government expenditures or guarantees, and no additional debt burden for the banks or the households. For the country, housing is a critical element of wealth as it operates as a vehicle for household saving,” he emphasised. In the initial stage of the scheme, nine participating developers are offering about 1,000 homes priced below RM500,000 to the eligible individuals. The developers are EcoWorld Development Group Bhd, IJM Land Bhd, IOI Properties Group Bhd, Mah Sing Group Bhd, PKNS (Perbadanan Kemajuan Negeri Selangor), PNB Development Sdn Bhd, Sunway Bhd, Trinity Group Sdn Bhd and UEM Sunrise Berhad. “We are also joined today by our biggest banks, Maybank and CIMB Bank, which are contributing as institutions to the 80% portion of the home price,” added Tong. At the launch, Dr Mahathir also presented the first three homebuyers on the FundMyHome.com platform with keys to their new homes, all located at Eco Majestic’s Harmoni Apartments. Eco World Development Group Bhd chairman and founder Tan Sri Rashid Abdul Manaf in his welcome speech said FundMyHome is an exciting and innovative new platform that will help many more Malaysians become homeowners.